We came back to Thailand specifically to participate in a Thai celebration that turned out to be the most fun and unusual holiday we’ve ever experienced. It was completely worth the return trip! In mid April, some of the southeast Asian countries celebrate their new year. 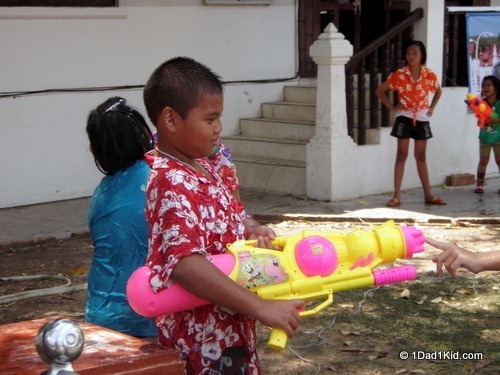 In Thailand, it is referred to as songkran. What was once a humble Buddhist celebration that involved the ritual bathing of buddha statues with scented water has evolved into a 4-day countrywide massive water fight (unless you’re in Chiang Mai where it can stretch into a whole week). When visiting Thailand during songkran, you don’t leave your lodging unless you’re wearing clothes that you’ll be comfortable getting soaked in. Most locals and tourists carry small plastic bags that will accommodate money and their cell phone. Only the elderly (although many of them join in, too) and some of the monks are spared. Pretty much any time of the day you can expect to be doused. Don’t worry. 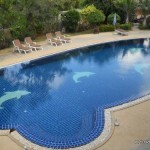 Thailand is usually very hot this time of year, so you’ll probably appreciate the cooling down. Homes and businesses will often have large buckets of water, children’s pools, etc., filled with water by the road. The children are usually armed with bowls and water guns while the adults enlist large buckets to drench passersby. Some of them don’t bother with buckets and just shoot you with water from a hose. Watch out for pickup trucks, too. Passengers in the back are only too happy to soak people as they drive by. The holiday can also involve dressing up in floral shirts, wearing masks, and even cross dressing. 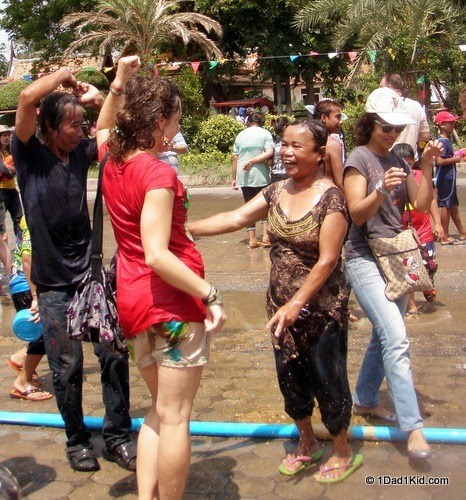 Basically the idea of songkran is to have fun. And the Thais go out of their way to make sure it is a blast. No pun intended. 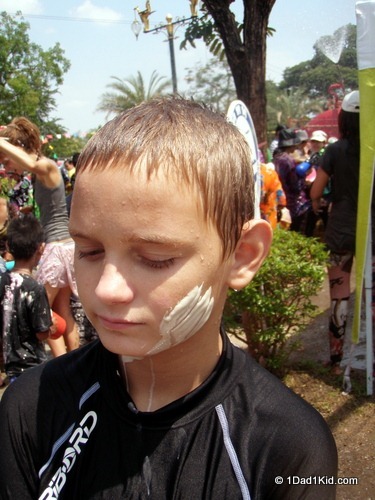 In addition to being drenched with water, some Thais will “bless you” by putting a mixture of flour or talcum powder, water, and possibly menthol on your face. The cheeks are the best for this. If they put it on your forehead, when you get water dumped over your head your eyes are going to be unhappy. Different cities and towns have their own special nuances. Bangkok, being a very large city, is probably more sedate and has official water fight areas, as well as a long list of other rules (which may or may not be ignored). 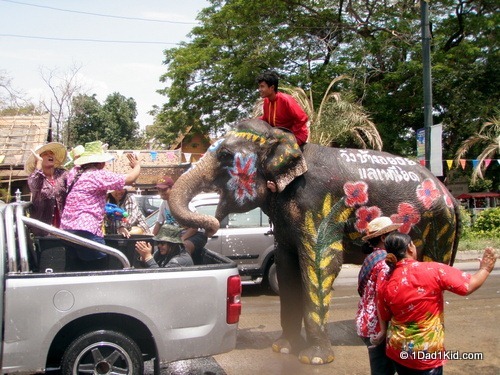 Chiang Mai really gets into it and is probably the most fun spot in all of Thailand for celebrating songkran. Part of the city is surrounded by a moat which makes refilling your weapon of choice much easier. Even the police are known to get into water battles with people. 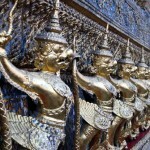 We chose Ayutthaya for our songkran experience. We wanted a less-crowded town that was more laid back. Ayutthaya is also home to some UNESCO World Heritage sites, so we had great places to explore before the festivities began. One of the main reasons we headed there, though, was because elephants join the celebration. It sounded like too much fun to be able to participate in a citywide water fight and to get sprayed by elephants. We made the right choice for sure. 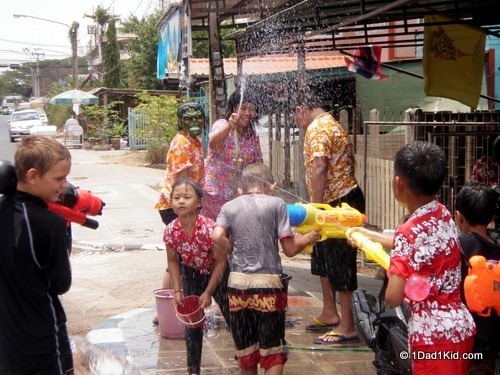 Songkran is easily the most fun and unusual holiday we’ve ever experienced. There are no strangers. Everyone in the city are friends, gleefully celebrating together, dancing together in the streets, and splashing and shooting people with water as much as they can. I walked around with a huge smile on my face the whole day. And I wasn’t alone. Tigger and I both agree that more cultures need to celebrate songkran. I’ve never seen a whole city come together like this to just celebrate and be joyous together. Happy new year indeed! What is the most fun holiday or festival you’ve experienced? 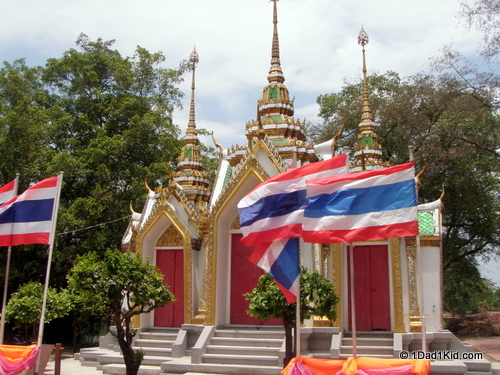 I have to admit that Sonkgran is not my favorite holiday in Thailand, but it depends where I am. If I go to province and rural areas, celebrations are normal. 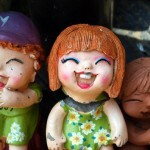 At touristic places usually Thai New Year, easily turns into insanity. That’s why we went to Ayutthaya. I didn’t want to be in Bangkok or Chiang Mai for songkran. Very cool, never heard of Songkran! SO much fun! Hope you get to experience it. I got the menthol talcum on my face and was like “Ahhh! It feels like I put on a Tiger Balm facial mask!” But was on a diving boat, so, the next dive came up and the tingling was short lived. 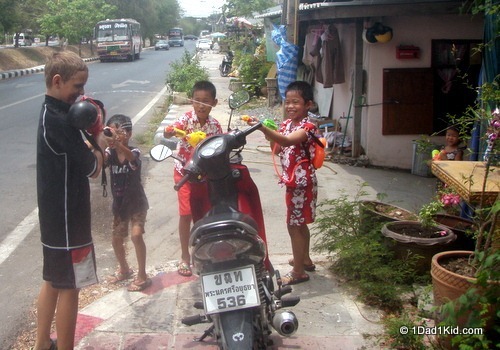 Tigger looks so cute spraying the locals with his super soaker! That settles it. Next year I simply MUST head over to Thailand for Songkran. 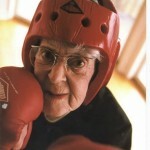 And I like your notion of Ayutthaya vs. Bangkok or Chiang Mai. Yes, definitely do! I’ll be doing a separate post on Ayutthaya with a recommendation on lodging so you can use that when you come next year if you want. Really loved the town on the island. Could’ve easily stayed longer. Da Lat is looking like around mid May or so. Will just depend on how much we fall in love with other places while traveling (and how much we like or not as thoroughly enjoy travel within the country LOL). We arrive in Hanoi on the 25th and will be there for at least a few days. I love this! Who doesn’t love a water fight anytime it’s hot? And even better is the community participation and friendship you describe. Just so cool – can’t WAIT to experience this! Exactly! How can you not love it? I can imagine it getting really old after a few days, though. Three days was long enough in my book. In Ayutthaya, it was mostly the 1st day. After that it went so smaller patches of celebrations. But everyone knew where to go if they still wanted to have maximum fun. This holiday looks totally fun. I love the everyone, even the police are in on the fun. the menthol I could do without best the rest sounds like a blast. Glad you made it there and shared your story and photos. It’s a complete joy! And fun to see the police either participating or laughing about it. I loved Songkran in Chiang Mai this year. Watching the families in the small sois of our neighborhood was just as much fun as being down in the moat area and all it’s craziness. It really was just plain, good, old-fashioned, water-fighting fun! Glad you guys liked is too. So much fun! I think I liked the neighborhood celebrations the most. Just seemed so natural. Although, getting sprayed by elephants was also pretty dang cool. This sounds like too much fun to handle! I recently learned there’s such a thing as the Color Run, and Germany (possibly more countries?) is picking up what they call the Holi Festival, I haven’t figured out exactly what it means (the website’s in German…), but it looks like some real good fun – instead of water people use a colored powder to cover everyone around them. Ah looks / sounds like fun!! I learnt about this holiday while vacationing in Thailand last November… Our guy told us how fun in gets, especially in Chiang Mai. Definitely one to add to the bucket list, hopefully I’ll make it happen sometime!